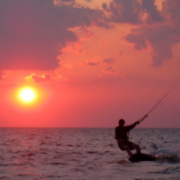 Puget Sound Kiteboarding Association - Pacific Northwest, Seattle, Tacoma, Bellingham and surrounding areas • View topic - Trainer kite suggestions? What can I say, this sport looks awesome and I'm very intrigued. I'm looking to get into kiteboarding and am looking for some advice on where to start. I'm a total noob, I've done some light research, but this seems like the place to be for kiteboarding information. I know I need a trainer kite, but what size? should I get a 2-4 line kite? what else am I looking for when buying a trainer kite? I most likely want to buy a used trainer, unless there is a better reason to buy new. Oh and if anyone has advice on locations to fly, that would be greatly appreciated as well - I live just north of downtown Seattle. I am still fairly new, but a trainer kite (from my experience) is just to help you get a feel for how a kite operates (wind window, manuevers, etc). So you'd be fine with a basic HQ 3M 2 line trainer kite. I used one for a week or so until I had enough money to purchase a 10M for snow/surf kiteboarding. Most trainer kites relaunch pretty easy. Okay, I figured it didn't need to be too fancy since it is an introductory phase. I'll see what I can find, I can't wait to get started. Thanks for the reply. I think you can rent one from Urban Surf. You won't use it much after you start kiting. I bought one and kept it around for friends to use, so, buying one as a friend recruitment tool is not a bad idea either. Jetty usually starts in May or June. I'll see what I can find, I can't wait to get started. Thanks for the reply.